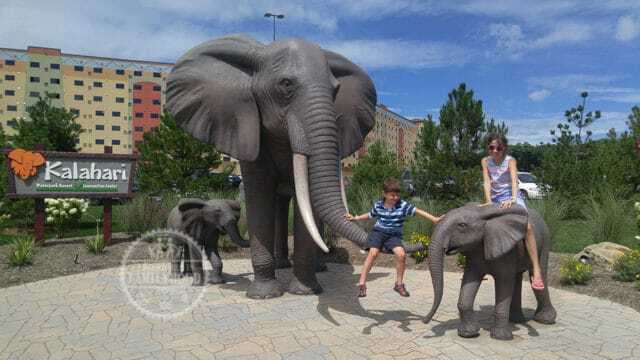 Home » Travel » Kalahari Resorts, PA: Is it Worth it? 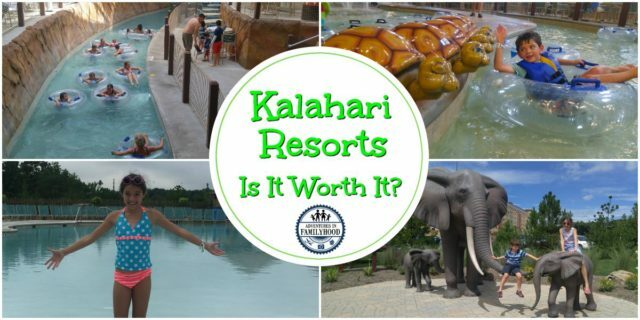 Kalahari Resorts, PA: Is it Worth it? Kalahari Resorts’ newest location in Pocono Mountains, PA is expanding this spring with the opening of Phase 2 in March. Our family visited the resort last summer when only the first phase was open. We thought it had a lot of potential. We graded the various elements of Kalahari Resort for family appeal and identified areas with room for improvement. Let’s see how the new additions might improve upon a good family destination. 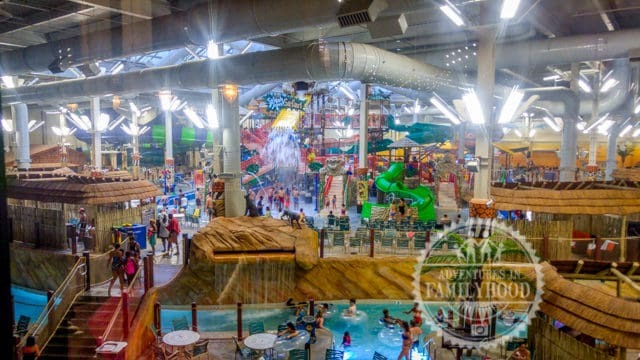 Kalahari Resorts in Pocono Mountains, Pennsylvania is a Resort and Convention Center that features an indoor waterpark that is open 365 days a year. 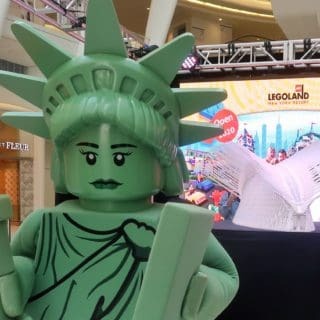 They are currently getting set to open an expansion that will double the size of both the resort hotel AND the indoor waterpark. Here’s everything they will have once the expansion opens. 977 guest rooms containing 1, 2, 3-bedroom suites, and a 5-bedroom suite. Gorilla Grove Treetop Adventures aerial forest park and ropes course. Keeping in mind that not all of this was available when we visited last summer, here are the grades we gave Kalahari on delivering the total family experience. The first thing about Kalahari Resort that we noticed was the theming. It was evident as we pulled up to the resort, and it really hits you when you walk in to the incredible lobby. It felt like we had arrived somewhere. We all felt excited to explore the resort and see what we could discover. The African theme continued through the hallways and in our room. It was a good mix of elegant and whimsical touches. The safari bunk bed was a fun place for the kids to hang out. It was totally worth the extra money to upgrade from the Desert room to the Kids Bunk room. The minus is simply because we found some places where the theming lacked. Most notably the ceiling of the lobby and stairwell. We found ourselves taking the stairs more often than the elevator to get back and forth from the lobby/waterpark to our room. Each time I was in there I couldn’t help but notice that there was no continuity. For families who want a resort to be immersive, Kalahari does an excellent job. 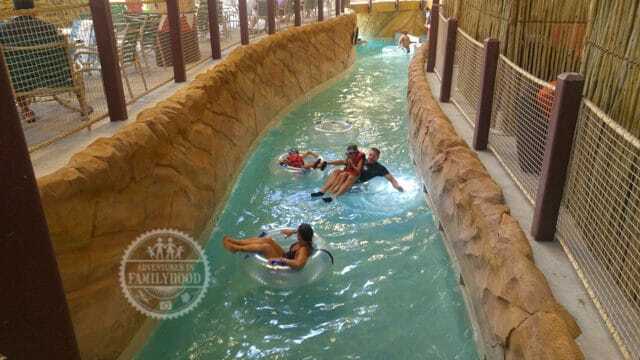 The centerpiece of Kalahari Resort is the amazing indoor waterpark. 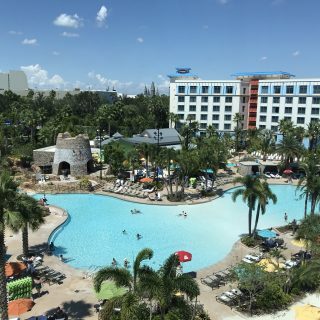 Our resort package included admission to the waterpark, but there is also a daily admission for non-resort guests. A day pass is $79 per person ages 2+. There is a $10 discount for military with ID, or for an evening pass (after 5pm). I was impressed. I certainly didn’t expect it to be so huge. There were many water slides in all shapes and sizes. Kids of all ages are sure to find something they like. The lazy river is a bit narrow. But considering this is all indoors, it’s pretty amazing. The littlest family members get their own area, with small water slides and a miniature lazy river. Bonus points for the water table with built in seats for babies. Of course, there are also some thrilling water slides. Some you ride like a traditional slide. Others use tubes or rafts and were more like water coasters. 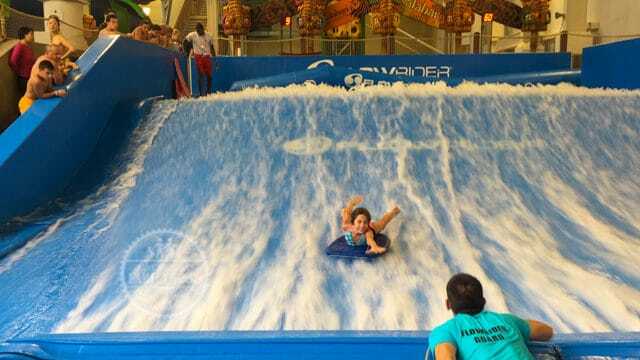 One of the surprise hits was the Flow Rider. Both Bella and Jackson got out there and took turns riding the waves on a body board. They had never done anything like that before and it was very cool to see them overcome some of their fear. Although it was cloudy on our second day, we got some time in the outdoor pool area. This is also part of the waterpark. It includes a main pool, a swim-up bar, and a basketball pool area. The indoor hot tub also has an outside portion. The outdoor area is open from Memorial Day to Labor Day. The waterpark offers a lot of different experiences. There is something for those who just want to relax and plenty of thrills, as well. Our kids aren’t old enough to explore on their own. I imagine that families with older children could easily divide and conquer. 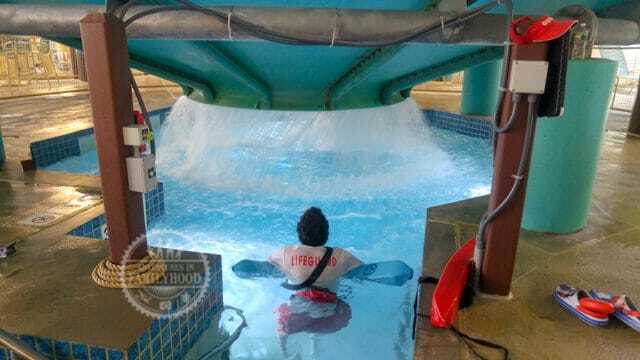 The fun of pools and water slides always comes with a little bit of danger. We were impressed with the number of lifeguards we saw throughout the waterpark. 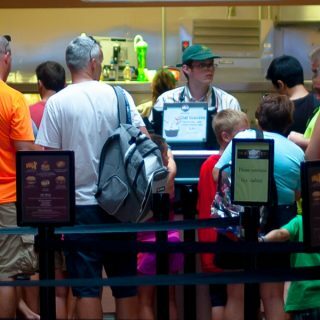 There is an obvious emphasis on safety at Kalahari, and as parents we can appreciate that. 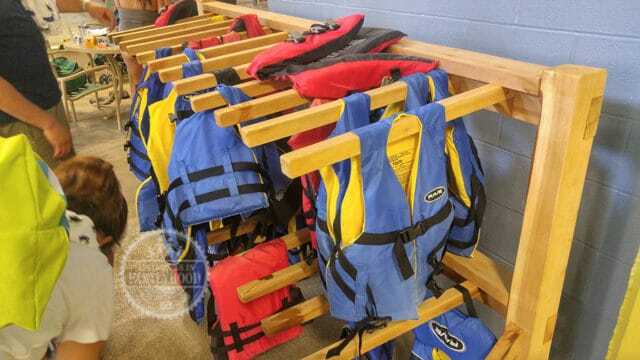 In addition to the lifeguards, complimentary life vests were provided and required for children under 48″. You can bring your own if it is Coast Guard approved and fits your child. 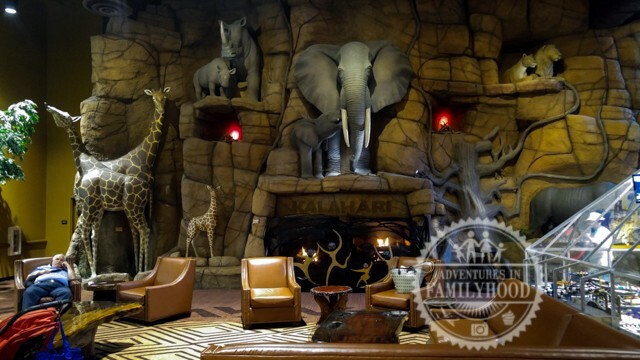 The Kalahari Adventurers Club offers activities for the kids each day. Some require paying extra, but the majority were free. 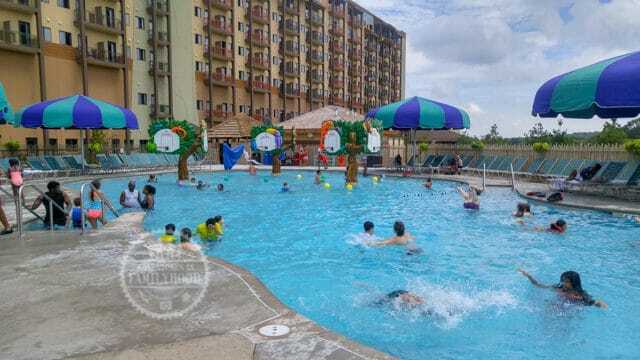 It was nice to know those activities were there, even if our kids didn’t want to leave the waterpark. 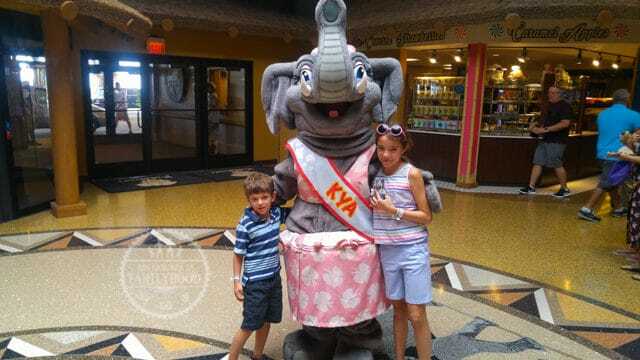 Even though we were familiar with the Kalahari characters, our kids still enjoyed the opportunity to meet them. (We did see some information about a character breakfast. That’s something we love to do at Disney, but we’re not familiar enough with Kalahari’s characters). Alright… aside from the waterpark, the next biggest attraction at the resort when we were there was the Arcade. The kids loved it. But for us, it reminded us of our local Chuck E. Cheese. You have to pay to play everything, and various games reward you with points which can be redeemed for prizes. And of course, the good prizes require a seemingly unattainable number of points. To be fair, it also has a glow-in-dark miniature golf course and miniature bowling alley. Those are cool, but are also an extra expense. The amount of fun the arcade provided was directly tied to our wallets. 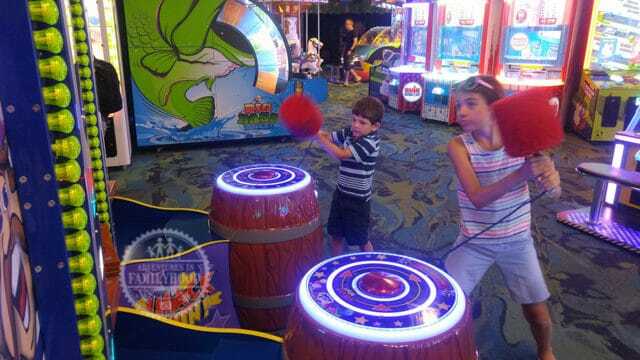 For families looking to get away and spend a lot of time in one place, that arcade can go through your funds quickly. 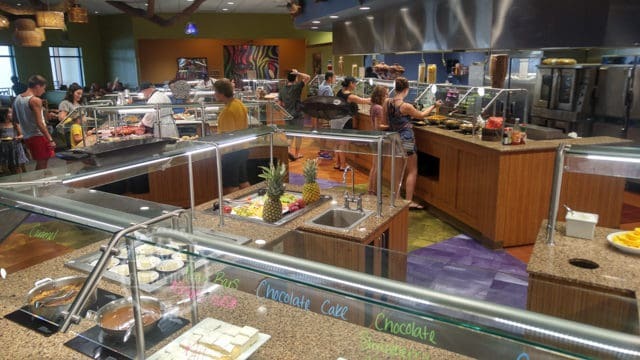 If there was one area that we felt Kalahari could most improve upon, it was dining. We ate a meal in each of the 3 sit-down restaurants, and were less than impressed. It’s hard to give a good grade on the dining experience when the pizza you had poolside is arguably the best meal of your visit. I think an opportunity was missed to carry over the African theme into the food, as well. I realize that opinions on food are subjective, and perhaps we caught Kalahari’s restaurant team on a bad couple of days. But, we were consistently underwhelmed when it came to our dining. 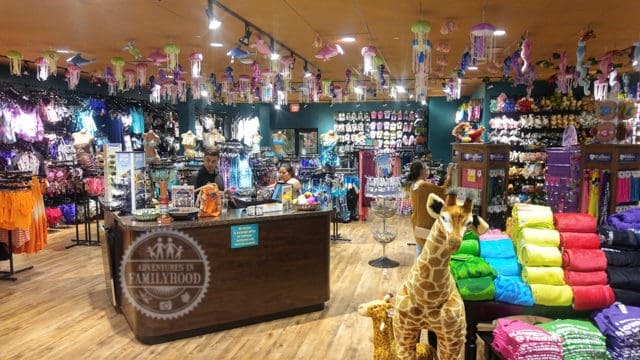 Kalahari had a few shops that stocked souvenirs and other merchandise. One of the shops was accessible from the waterpark in case you needed something. For the most part, we didn’t find ourselves in need of anything. We did shop for some souvenirs before leaving. The one thing I thought they might sell and would have definitely bought — A Waterproof Case For My Phone — was nowhere to be found. I would imagine something like this universal waterproof phone case they sell on Amazon would sell pretty well there. 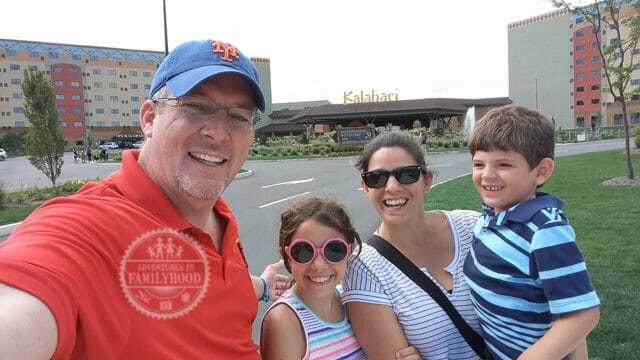 We had fun at Kalahari, but we weren’t quite sold on it being a family destination due to the lack of things to do outside of the waterpark. The dining options were disappointing, but might definitely be improved upon. 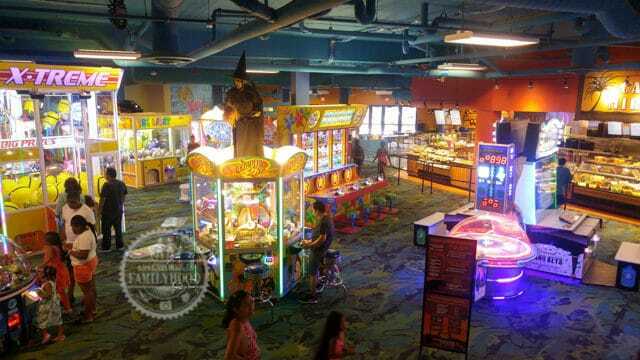 For a family of four, a one-day visit would be enough to enjoy the waterpark, a bit of the arcade, and a meal or two. For the money you’d spend on waterpark access, getting a room and staying the night makes sense for those driving a bit of a way to get there. So what’s changed since our visit? 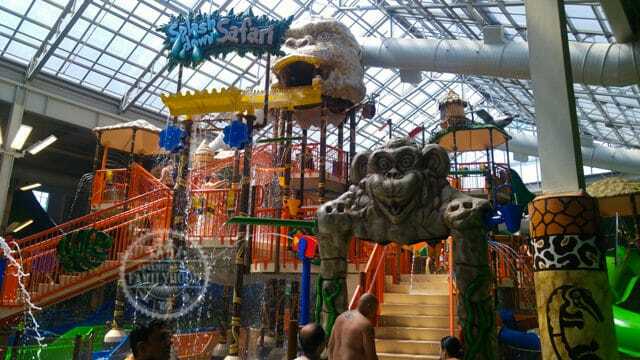 Since our visit, Kalahari Resorts, PA has opened Gorilla Grove Treetop Adventures. From the website description it looks interesting. 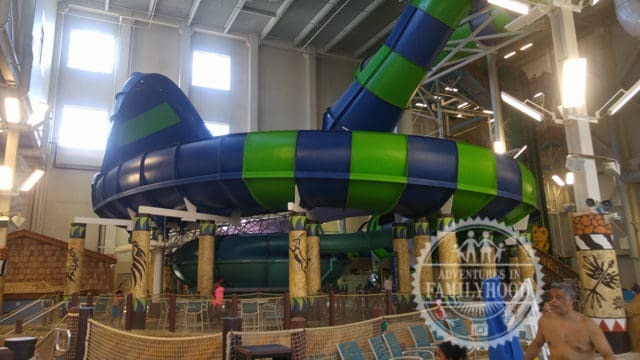 Having something in addition to the waterpark is a big plus and will go a long way towards making Kalahari Resort more of a family destination. I couldn’t find pricing on the website, as the outdoor park is closed for the winter. I called Kalahari and they told me that Gorilla Treetop Adventures costs $59 per person for a day pass. Only those climbing need a pass. Family members are welcome to watch, take pictures, etc. for free. With twice the attractions, this waterpark is going to be amazing! The cost of a day pass (provided it doesn’t double as well) will make it worth a day trip, though staying overnight will still be the most cost-effective option. The arena is a high-tech, virtual reality game. Think laser-tag with computer generated scenery. It sounds very cool from a technology standpoint. You walk around in a simulated world working as a team with your fellow players. (I don’t know exactly how they keep you from running into walls or other players). The one problem I could see some families having is the violent nature of it. I don’t personally mind shooting games. I played many as a kid. But, there are those who don’t agree with violence on TV and in video games. If you are looking to get away from that on your vacation, you probably wouldn’t be interested in The Arena. I should point out that there is a minimum age of 13. So, neither of my kids would be able to play yet. They are adding 3 new dining options. The Marrakesh Market should already be open. Perhaps that will help bring some of that African theming into the food options. The other two scheduled to open mid-March are Sortino’s Italian Kitchen and the Double Cut Grill steakhouse. More dining options can’t hurt. 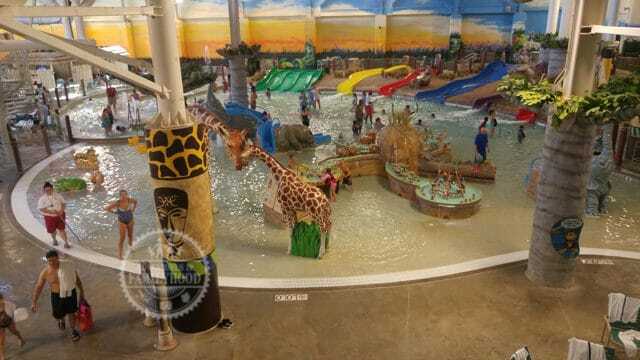 We’re very excited about visiting Kalahari Resort again due to the waterpark expansion. We hope our previous dining experiences were just an 0ff week for the resort. It will definitely be good to have some new dining options to choose from. The question will be whether to stay just one night or more. On our last visit, one night would have been more than enough. 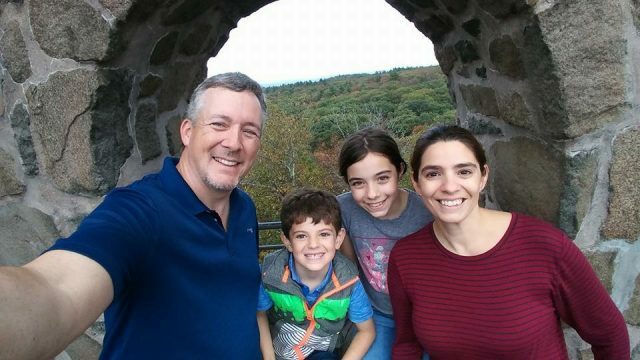 But with more to see and do, it might be worth splurging on the 2-night family escape package again. 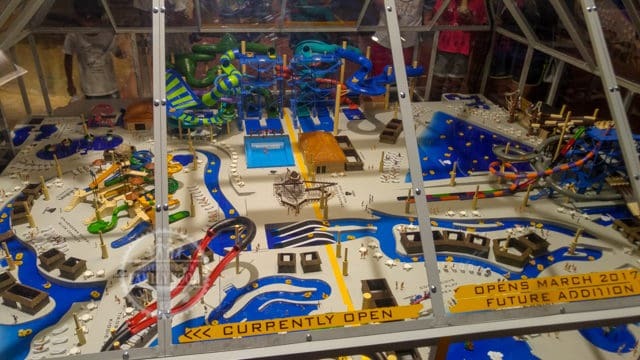 On the off-chance we do tire of the water attractions before our stay ends, we could explore other attractions in the area to help change things up. 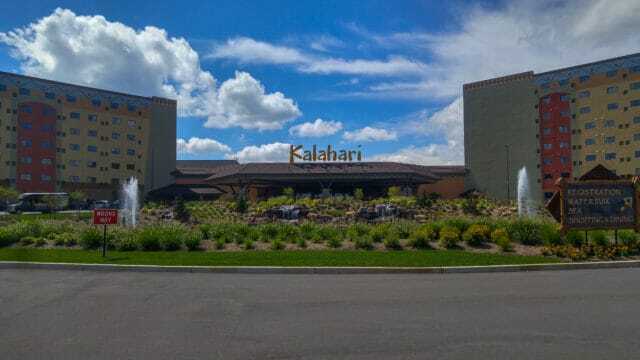 Kalahari Resorts has potential, that’s for sure. We can’t wait to see if it lives up to it! I want to go here too!! Thanks for sharing. roadeavour.